Here's a link to the patent. "The present invention provides an improved technique for spinal fusion involving the administration of an HMG-CoA reductase inhibitor to a fusion. The HMG-CoA reductase inhibitor is preferably delivered to the site by a carrier[This will be virtually impossible to do by homeopathic means]. More preferably, the HMG-CoA reductase inhibitor is delivered to the site by a non-compressible delivery vehicle. The invention is suitable for promoting non-anatomic or heterotopic bone growth between any bony surfaces where bone growth is desired but does not naturally occur." This means the invention is capable of promoting adult height growth on the longitudinal ends of the bones. There's evidence though that longitudinal apposition already occurs on long bones but it is too slow and it is likely nullified by osteoclast activity. One possible HMG-CoA reductase inhibitor listed is lovastatin. But there's no way to mimic the carrier aspect. "Preferably, the HMG-CoA reductase inhibitors are administered directly to the site of fusion. More preferably, the HMG-CoA reductase inhibitors are administered via a carrier, such as an open cell matrix. The carrier can further comprise of other therapeutic agents such as antibiotics, painkillers, antioxidants, growth factors, and timed release agent." "the present invention involves the use of HMG-CoA reductase inhibitor to promote bone growth and fusion between any two bones. Bone fusion is effective in treatment post-traumatic, degenerative and/or inflammatory arthritis conditions. In one embodiment, the HMG-CoA reductase inhibitor is used in podiatric surgery, such as to immobilize the metatarsals or the ankle joint. Furthermore, HMG-CoA reductase inhibitors can be utilized in facial plastic and reconstruction surgeries, such as to fix the maxillary and mandibular bones, increase cheekbone morphology, and cranial vault fixation and remodeling (e.g., due to craniosynostosis). "<-the problem is you really don't want to fuse two long bones together. 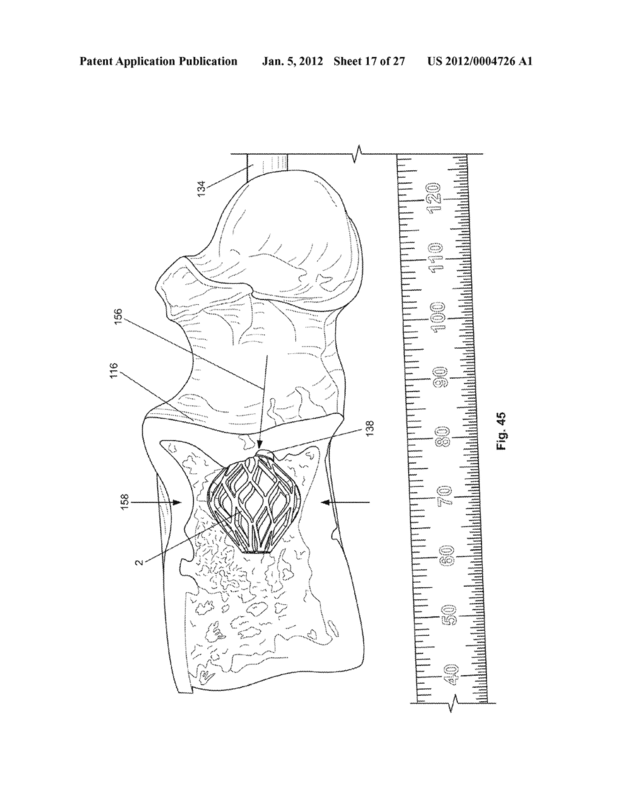 "Non-compressible carriers such as surgical instrumentations can be used as an adjunct to obtain a solid fusion or provide stability. Surgical instrumentation can be fabricated from titanium and/or alloys of titanium, stainless steel, ceramic materials or rigid polymeric materials. Typical medical instrumentations include, for example, rods, hooks, braided cable, plates, screws, and threaded interbody cages. Instrumentation can decrease the likelihood of non-union by maintaining spinal stability while facilitating the process of fusion. For example, instrumentation can be used to bridge space created by the removal of a spinal element such as an intervertebral disc. Instrumentation can also be used to correct a deformity or as an internal splint to hold the vertebrae together while the bone grafts heal. In a preferred embodiment, an instrument is coated with synthetic apatites, or preferably hydroxyapatite. Unfortunately, even with the use of instrumentation, non-union remains a common problem. " "The terms "non-anatomic" and "heterotopic" bone growths refer to the generation of bone in regions that naturally do not grow bone." "The term "HMG-CoA reductase inhibitors" or "statins" as used herein refers to compounds that inhibit the enzyme 3-hydroxy-3-methylglutaryl coenzyme A (HMG-CoA) reductase. HMG-CoA reductase is the principal rate-limiting enzyme involved in cellular cholesterol biosynthesis. The pathway is also responsible for the production of dolichol, ubiquinones, isopentenyl adenine and farnesol. HMG-CoA reductase converts 3-hydroxy-3-methyld-glutaryl CoA (HMG-CoA) to mevalonate." "HMG-CoA reductase inhibitors, or statins, enhance the production of osteoblasts, the cells that produce new bone and enhance osteoblast differentiation. "<-So you could just take Lovastatin and get more osteoblasts depositing bone on the subchondral plate. The problem is subchondral bone apposition for longitudinal growth is incredibly slow and it's not synergestic with LSJL where you're trying to induce endochondral ossification which is much faster. "Examples of the HMG-CoA reductase inhibitors of the present invention include, but not limited to, lovastatin, pravastatin, velostatin, simvastatin, fluvastatin, cerivastatin, mevastatin, dalvastatin, fluindostatin, atorvastatin, or a prodrug thereof, a pharmaceutically acceptable salt of any such HMG-CoA reductase inhibitors, or prodrug thereof. Preferable salts include calcium and/or phosphate salts. In a preferred embodiment, the HMG-CoA reductase inhibitor is simvastatin or simvastatin calcium. In another preferred embodiment, the HMG-CoA reductase inhibitor is lovastatin or lovastain calcium." The problem is that this method does not induce bone growth by endochondral ossification. Natural appositional longitudinal growth of the fingers is reported to be 0.34mm per decade. Longitudinal shrinkage in the lower legs occurs at a rate of 2.4mm per year. It's pretty clear that osteoclasts, osteoblasts, and articular cartilage endochondral ossification does have the ability to add or remove height from bone. The problem is that you'd need to stimulate osteoblasts to extreme levels(by lovastatin supplementation or other means) to get any noticeable height, the synergy with LSJL is unclear, and it would stimulate bone thickness everywhere so you'd increase bone thickness a great deal with a minor increase in length resulting in acromegaly-like proportions. The advantage over LSJL, is that you could do it without any exercise and only supplements. "An expandable support device for tissue repair is disclosed. The device can be used to repair hard or soft tissue, such as bone. The expandable support device can have interconnected struts. A method of repairing tissue is also disclosed. The expandable support device can be inserted into a damaged bone and radial expanded. The radial expansion of the expandable support device struts can cause the struts to cut mechanically support and/or the bone." So it's a device that supports the bone and can therefore make you taller but the device would not be natural. "An expandable support device for repairing damaged bone, the expandable support device having a longitudinal axis, and comprising: a first terminal end comprising a radially external first attachment configuration; a second terminal end comprising a radially external second attachment configuration, and a radially internal attachment configuration; a first strut having a first strut cross-section; a second strut connected to the first strut, wherein the first strut is substantially deformable; and wherein the first strut cross-section is configured to encourage bone growth toward the longitudinal axis. " 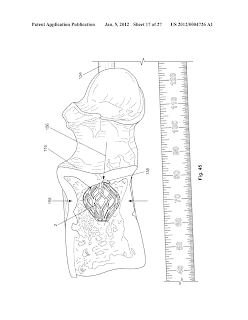 "The device can be configured to contract in a longitudinal direction during deployment in a bone." "Any or all elements of the expandable support device and/or deployment tool and/or other devices or apparatuses described herein, can be, have, and/or be completely or partially coated with agents and/or a matrix a matrix for cell ingrowth or used with a fabric, for example a covering (not shown) that acts as a matrix for cell ingrowth. The matrix and/or fabric can be, for example, polyester (e.g., DACRON® from E. I. Du Pont de Nemours and Company, Wilmington, DE), polypropylene, PTFE, ePTFE, nylon, extruded collagen, silicone or combinations there"
The device may have potential to work by generating forces within the bone that stretch it but there have been no studies validating it and we don't know how much force the device can generate. PatentIII(this is another fixation fixation device that may be useful). Tyler you live in San Diego right? Do you think it would be possible to get in contact with the three Californian scientists from the first patent to see if their research has advanced at all?